Seems good for the price, lots of availability. Heat for the price. Compared to John Lewis it's £100 cheaper. That said though, reviews on youtube dont seem to be amazing though. Heat for the price. Compared to John Lewis it's £100 cheaper. That said … Heat for the price. Compared to John Lewis it's £100 cheaper. That said though, reviews on youtube dont seem to be amazing though. Voted hot. Sweet reviews but the fact that you can't use predownloaded maps may not work well for some with limited data plans. Ordered , picked up a cheap Navigon license a while ago so hopefully compatible. I tried this some time ago. Whilst the display is rather cool and works surprisingly well in daylight and night, the whole idea is a bit meh. You still need your phone for the audio part of navigation and the unit only displays basic navigation details. So if you prefer a more 3D map, this won't cut it. To me it was just an extra set of wires and another uneccesery gadget that you had to set up each time you got into the car. Ordered , picked up a cheap Navigon license a while ago so hopefully … Ordered , picked up a cheap Navigon license a while ago so hopefully compatible. Should be fine. 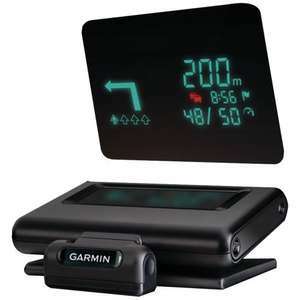 "For use with Garmin StreetPilot® for iPhone® or NAVIGON mobile apps"
I tried this some time ago. Whilst the display is rather cool and works … I tried this some time ago. Whilst the display is rather cool and works surprisingly well in daylight and night, the whole idea is a bit meh. You still need your phone for the audio part of navigation and the unit only displays basic navigation details. So if you prefer a more 3D map, this won't cut it. To me it was just an extra set of wires and another uneccesery gadget that you had to set up each time you got into the car. The Garmin app for iOS is a free download from the Apple Store. There is free Garmin HUD app for IOS, Android and Windows phone which includes European maps resident on phone and a once/year update. I have map gps in car but this HUD display in front of my eyes makes driving much safer. Great idea, hope car mnufacturers fit HUD as standad on future new cars. Was very suprised when my new Prius no longer had GPS info on it's HUD unlike my previous one. Very backward step for Toyota. Ordered one off their email.... was gonna buy 5 but didn't want to spoil it for anyone else £170 on argos ebay! Only available in a store in Scunthorpe and none online - Bit far from South Wales ! There is free Garmin HUD app for IOS, Android and Windows phone which … There is free Garmin HUD app for IOS, Android and Windows phone which includes European maps resident on phone and a once/year update. I have map gps in car but this HUD display in front of my eyes makes driving much safer. Great idea, hope car mnufacturers fit HUD as standad on future new cars. Was very suprised when my new Prius no longer had GPS info on it's HUD unlike my previous one. Very backward step for Toyota. ​I was surprised to find a HUD on a Toyota, very good car though. Only 1 left, 203.6 Miles away. That's bit too far. What is the point of a HUD when you need to look down to the dashboard to see the display? Can I use this in my Apache helicopter? What is the point of a HUD when you need to look down to the dashboard to … What is the point of a HUD when you need to look down to the dashboard to see the display? How on earth did you manage to pass your driving test?! I assume your sat nav is built into your windscreen, directly in your line of vision. I assume your sat nav is built into your windscreen, directly in your … I assume your sat nav is built into your windscreen, directly in your line of vision. Just been told the entire company has 1 left in Walsall. Too far for me. Managed to get the last one from Walsall. Just tested it out and its a bit crap to be honest. The same way you passed your reading test. This HUD is positioned down on the dash and projects the image on to the screen down by the dash - not up into the line of sight. So what's the point of a HUD when you need to look down to the dash to see the display? Right, you were being a pendant. Oh, is it pedantic to want a Head Up Display to be a Head Up Display, and not a Somewhere Down By The Bottom Of The Windscreen Display? Oh, is it pedantic to want a Head Up Display to be a Head Up Display, and … Oh, is it pedantic to want a Head Up Display to be a Head Up Display, and not a Somewhere Down By The Bottom Of The Windscreen Display? If you're going to continue with the daft pedantic answers: The HUD works absolutely fine for those of us that are fairly short and look out from the very bottom of the windshield. So technically this should be a Head Up Display For Those Of Us That Are Five Feet Tall. An idiot could in theory attach it wherever they liked. If you're going to continue with the daft pedantic answers: The HUD works … If you're going to continue with the daft pedantic answers: The HUD works absolutely fine for those of us that are fairly short and look out from the very bottom of the windshield. So technically this should be a Head Up Display For Those Of Us That Are Five Feet Tall.Happy now? ​No I'm not Happy, but you must be either Grumpy or Sleepy because topass above is certainly Dopey. ​No I'm not Happy, but you must be either Grumpy or Sleepy because topass … ​No I'm not Happy, but you must be either Grumpy or Sleepy because topass above is certainly Dopey.